We came into Sichuan on the bus from Xi'an. We got off the bus at Guangyuan, see here for a description of highway 108 from Hanzhong to Guangyuan. From Guangyuan we followed highway 108 SW for a few kilometers until we turned north on highway 212. There was some construction work going on but by the time you get there, there will be a good road as far as the village of Sandui at the foot of the reservoir. Unfortunately the road along the reservoir is a real roller coaster, the reservoir is at about 700m, and at one point the road reaches 1200m! It is steeply up and down the whole way and the surface although tarmac is bumpy so you can't even go fast down the hills. We think there may be passenger boats on the reservoir (there is certainly something in summer) and there were times when we wished we were viewing the vertiginous scenery from one! When the road crosses the border into Gansu the tarmac ends and the bumping begins in earnest. The next 90km to the town of Wenxian were about half tarmac and half stony track, we didn't enjoy it!. Then 20km before Wenxian smooth tarmac appeared and stayed with us all the way via Nanping and Jiuzhai Gou to Songpan. Highway 212 heading north towards Wudu, Gansu was also tarmac. The pass between Jiuzhai Gou and Songpan in 3525m. On the road signs it is marked as Gonggangling, don't be fooled into thinking that this is a village - there is nowhere to stay! There is a village about 25km from Jiuzhai Gou in a flat area at about 2650m. In January this road was very quiet, but judging by the number of hotels in Jiuzhai Gou and the number of buses parked up there for the winter, it must get busy in the summer. The road from Songpan south to Chengdu (highway 213) was well made and (in January - maybe not in summer) quiet. The first 90km from Songpan were gently downhill, then the road climbed as it passed two lakes before dropping 350m in a series of hairpins. Nearer to Chengdu there was some up and down. In Dujianyan, about 40km NW of Chengdu we turned south to Qingcheng Shan on a good road (marked as a track on our map!). We spent a day there climbing the mountain of the same name (see Lonely Planet guide). When we left Mark's front rim split (due to wear, the road was perfectly smooth) so we had to return to Qingcheng Shan and get a bus to Chengdu to get a new rim. We found several good bike shops in Chengdu, including some selling Sun rims. When we finally left Qingcheng Shan we rode south to Qiong Lai (good road) and thence to Pu Jiang partly by tracks (We think if you ride from Qiong Lai 12km towards Ya'an before turning off left towards Pu Jiang, you can ride a good road all the way - ie. ignore the first marked turning to Pu Jiang). From Pu Jiang there is a good road south to Danling and then to Hongya. From Hongya the road to Leshan is mostly bumpy tarmac and a bit more busy. You can't ride on the expressway but there is a turn off just before it for a town called Mianzhu (?) from where a good road with bike lanes leads into Leshan. From Leshan a wide road with dual bike lanes leads directly to Emei Town. It is a busy road but quite safe thanks to the bike lanes (and it isn't an expressway as marked on the map). After three days on Emei Shan (the Teddy Bear cafe and guesthouse is a great place to relax) we wanted to head west to Hanyuan but the town of Jinkouhe en route is closed and there are no through buses. So we had to head north on a good road up to Jia Jiang and then retrace our route to Hongya on bumpy tarmac. From Hongya we took a scenic though fairly busy road to Ya'an. It climbed and descended a couple of hundred meters over bluffs around a reservoir. In Ya'an we picked up highway 318 which was pretty busy for the first 20km but then some of the traffic turned off north. Again it was scenic, winding up through a gorge with steep cliffs. We had a day off in Tianquan (800m altitude) to rest before the Erlangshan pass. Highway 318 west from Tianquan was not too busy, very scenic through a deep gorge and well surfaced (one short very dark tunnel). There is a row of resturants and guesthouses 51km from Tianquan at 1550m altitude. 69km (2300m altitude) from Tianquan there is a 4km long tunnel, but it is well lit and ventilated and there is a walkway (best to use the southern walkway, the northen one is interrupted by passages to an adjacent service tunnel). There is a sign forbidding bicycles but no-one stopped us, however there might be a problem coming from the west because there is a toll barrier just before the tunnel at the western end. From the tunnel we climbed a little further to 2400m and then it was downhill all the way to Luding (1400m altitude). In Luding the road crosses the river (the road is so new they were still building the bridge when we passed, but there are several bridges in the town) and then it is uphill again. 20km from Luding the road forks, left to Kangding and right to Danba. Both were well surfaced. We went left, uphill to Kangding at an average angle of 1:30 for 30km. Traffic was light. Kangding is at 2560m altitude. From Kangding the road led upwards to the first big pass, 4298m at km 2879, 36km from Kangding. There were great views of Gongga Shan and other mountains. Then down to a junction with a road heading south (surfaced) where there was a small truckstop (food and accomodation). 9km further on there is the colourful small town of Xinduqiao with several nicer looking places to stay. 5km west of Xinduqiao is a junction with a road heading north (surfaced) to Danba and Daofu. This town is at about 3400m. The road west climbs to 4412m and then crosses a bleak, windswept grassy plateau for about 5.5km with a maximum altitude of 4475m. In summer it might be a good place to camp. It then descends steeply, watch out for large loose dogs by the truck watering station (I believe they have some kind of drip feed water cooling system for the brakes) at the bottom of the steep section. The road then descends into Yajiang, just below 3000m, there are a few truckstops from 12km beforehand which are much cheaper than the only foreigner licenced hotel in the town. The road from Kangding to Yajiang was all tarmac but sometimes quite bumpy, traffic was light. Yajiang has shops selling all essentials, a covered market and internet access. From Yajiang the road climbs to 4659m at km 3022, then it climbs and falls repeatedly for the next 100km, staying around the 4500m mark. There were bivi huts before and after the pass at km 3022 and at km 3032. These were bare huts, with a place to light a fire if you don't mind being smoked. Notable passes are the following: km 3049, 4600m; km 3069, 4718m; km 3096, 4500m; km 3121, 4300m. Litang is at km 3127. There is a shop in a village at km 3056, accomodation, cafe and shop in a small village at km 3090, there were a couple of cafes at km 3111 (road junction 16km from Litang) but apart from that and the bivi huts we saw no accomodation, shops or cafes between Yajiang and Litang. We camped one night, used a bivi hut one night and stayed in a bare room at a road maintenance depot at km 3080 because the weather was grim for camping (driving snow). The road from Yajiang to Litang was all tarmac but sometimes quite bumpy, traffic was light. Litang (about 4025m atitude) is an interesting Tibetan town, you could get anything mended there and buy all essentials. We stayed in the Shengdi Hotel by the fork to Xiangcheng / Yajiang, friendly, Tibetan and only 40¥ a night for a room. From Litang (about 4025m altitude) we headed south towards Xiangcheng. The road was flat for the first ten kilometers and then climbed 200m to cross a low pass by a monastery 17km from Litang. Over the pass it dropped 400m through a beautiful valley with plenty of camping possibilities. Then it crossed a small plain, by a bridge (3800m altitude) 40km from Litang there were truckstops with food and accomodation. Next the road climbed up through another picturesque valley with camping to cross a 4696m pass 71km from Litang. From the pass the road descended to just below 4500m to cross a river and then climbed back up to 4700m. Between 81km and 91km from Litang the road stays above 4700m, in winter there is no liquid water available here and we had to contend with a savage headwind. The road then drops slowly to Sangdui (the junction between the roads to Litang, Xiangcheng and Daocheng), 123km from Litang, altitude about 4100m. In Sangdui there is a truckstop with food, accomodation and basic shops (didn't see any petrol). From Sangdui the road climbs to a double pass, the first is about 4780m, 13km from Sangdui, then the road dips to 4740m before climbing to 4870m, 18km from Sangdui. The road is unsurfaced between 12km and 19km from Sangdui but apart from that is covered in reasonable quality tarmac, traffic is very light. There is nice camping with water around 30km from Sangdui. Xiangcheng is 83km from Sangdui, it is a small town with more than a dozen hotels (50-60Y for a room), internet, shops, market, petrol, etc. From Xiangcheng (altitude 3200m) the road climbs remorselessly in three big zig-zags to a pass at 4320m, 30km from the town. Then it descends to a valley at around 3650m and begins to climb again. 57km from Xiangcheng is a village with a row of shops and noodle cafes. I'm told (thanks Bill Weir) that there are accomodations here and that the Redaqupiling Temple nearby is worth a visit for the woodcarving and brilliant colors. The next pass tops out 68km from Xiangcheng at 3818m. 200m east of the col a tiny stream comes down to the road and there is a place to camp. Then the road descends to 3100m and runs alongside a river that flows to Derong. But it doesn't follow the river, too easy! Instead it climbs over a 3600m pass, 115km from Xiangcheng. There is camping amongst pine trees at the top but no water. 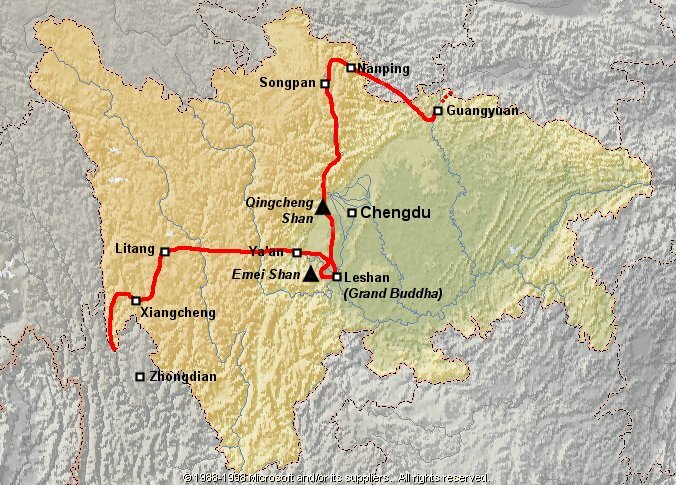 From there 48km of downhill takes you to Derong, a total of 163km from Xiangcheng. The road is nicely graded and surfaced and there is hardly any traffic. From Derong the road is dirt all the way to the highway, a distance of 79km. It isn't really bad, but pretty bumpy (the direct route from Xiangcheng to Zhongdian is 220km of dirt and over much higher passes). An English teacher in Derong told us that the road would be surfaced by 2005. Info added May 2005, from Bill Weir: the road is surfaced for the first 42km south from Derong. Traffic was light. There is a village 65km from Derong with a row of guesthouses and restaurants, it is connected by ferry across the Yangtze to the town of Benzilan. The next place to stop after that is 5km down highway 214, at km 1983. The dirt road meets the highway at an altitude of about 2000m and almost immediately starts climbing towards a 3100m pass, the pass summit is at km 2008 and just beyond it is a village with a guesthouse and cafes. From there the road drops to the junction with the Yangtze river road, at km 2017, 3000m. The road to Zhongdian then climbs to 3500m at km 2029, before dropping to Zhongdian at 3200m. We made this crossing from Kangding to Zhongdian between mid-February and mid-March. I would say that earlier in the year you could have some very cold weather to contend with (we had temperatures down to around -8°C at night and blizzards on some of the passes, we wore thermals, two fleeces and a lightweight duvet jacket and had sleeping bags with 500g down fill), although we met people who did the trip by bus in early February so the roads can be open. There is actually less precipitation early in the year, so snow blocking the road could be less of a problem. There is a description here: www.londontonewzealandbybike.web1000.com of a cyclist who made the crossing in December. We have been told that the roads around Wolong are blocked by snow in February. Also the direct road between Xiangcheng and Zhongdian is blocked by snow in February and the pass on highway 214 NW of Zhongdian can be closed by snow. Friends who made the trip in late March to mid-April had somewhat warmer weather but still snowy at times, see www.geocities.com/aliingi. The Chengdu plain can be cold (but above zero) and damp during the winter, we hardly ever seemed to see the sun. In summer I guess it gets pretty hot. Heights mostly from my wristwatch altimeter, calibrated against the occasional marked pass height. I include them because maps rarely show relief information.